The Summer Taiko (and Shamisen) Intensives in Hawaii was AWESOME!!!! July 30-August 3 – FIVE DAYS of TAIKO in HAWAII with a stellar cast of instructors! Discounts for 3 or more courses ends May 2. Register Now! MAHALO to all STI 2018 Participants who came from Near and Far! Taiko Center of the Pacific is excited to be able to offer FOUR 50% OFF Youth Scholarships for Sho’on Shibata’s Double Beta-Uchi course at this year’s Summer Taiko Intensive. These scholarships were made possible thanks to the generous support of the Dr. Ric Fund for Education, Arts and Culture of the Hawai’i Community Foundation! 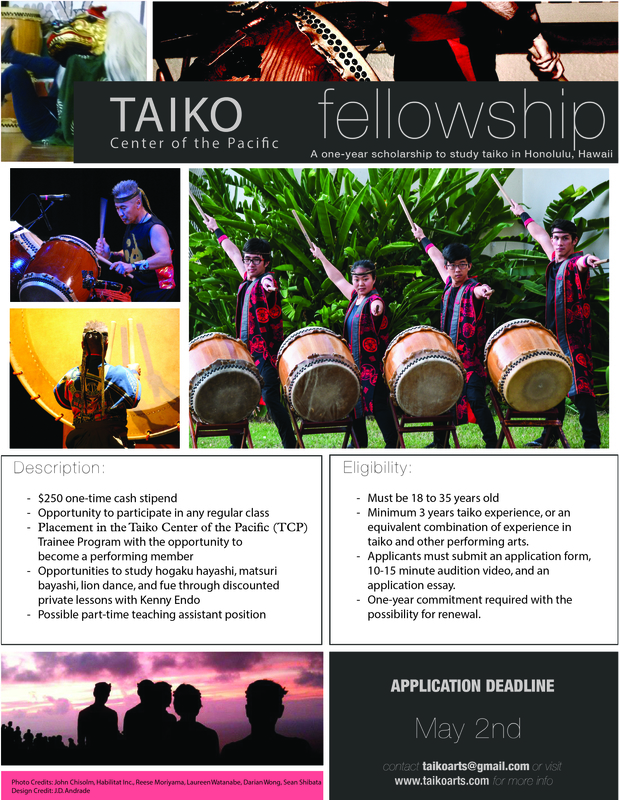 To apply, please fill out the application and email it to taikoarts@gmail.com.